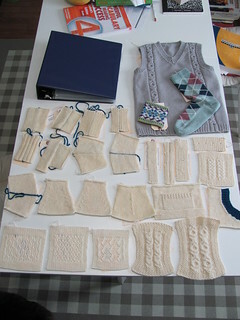 WiPs, a FO, and an Interview! 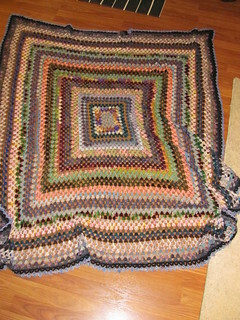 So, I’ve been killing time as best I can while waiting for my Master Knitter Level 2 binder to come back to me. The waiting is the hardest part, I think! What will I have to re-do? Is my vest up to snuff? Did my sock pass? … and so on and so forth. BUT, I found a project that is doing a pretty good job of taking my mind off of it. I’ve started a Celestarium! If you haven’t seen this pattern – you have to take a gander at it. 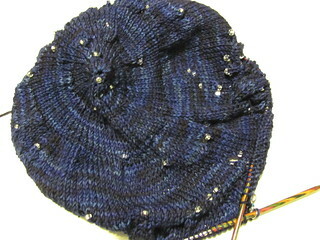 It’s the night sky in a shawl – how cool is that??!! 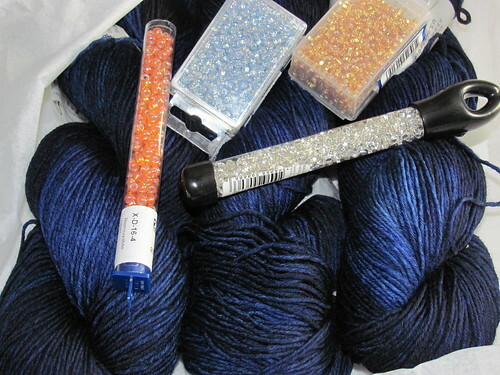 I’m doing mine in Dream in Color Everlasting Sock in the colorway ‘Nebula’, and I’m using several different beads including two sizes of silver lined crystal, a size 4 bead for the higher magnitude stars and a size 6 for most of the rest. I have some orange/red beads for the red giant stars like Betelgeuse, and some silver lined pale blue stars for non-constellation stars that I’m adding in just for kicks. It just looks like a blob right now. But there are constellations in there! 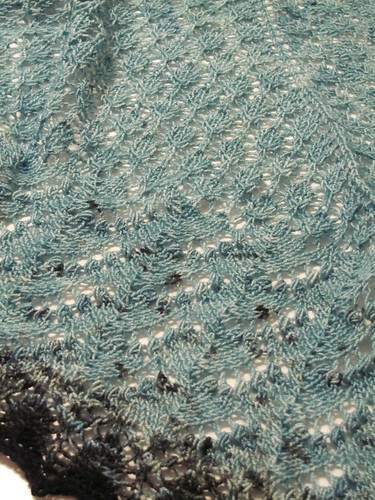 This is a Pi shawl, where you start in the center and double the stitch count every so often to get a circle – which means it starts off fast, but eventually gets to be a HUGE number of stitches. 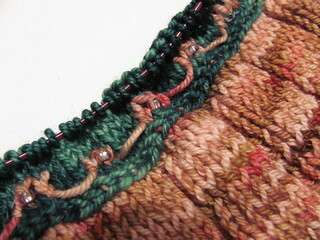 I’m at the section after the 5th increase – and I have 288 stitches on the needle. 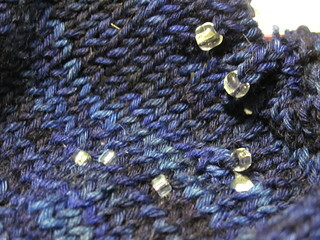 I have quite a few rows until the next increase, but it will then have 576 stitches – those rows will be LONG. 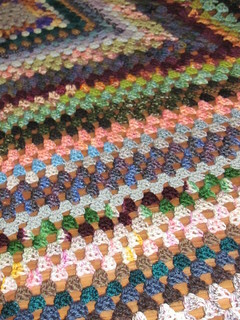 Other than paying attention to the chart to know where to put the beads and the yarnovers, it is not a difficult pattern – but it sure is fun!! I used the smaller needles on the heel and the sole of the sock – since I didn’t like the loose density of the fabric there on the larger needles. 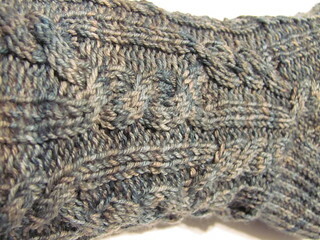 I love this yarn – it’s so soft! And the color was perfect for these, I think. I’m doing mine in DragonFly Fibers Djinni Sock (pink) and Sanguine Gryphon Bugga (green). I’m really liking the color combo so far. In other news – I’ve been interviewed by Deb Buckingham a.k.a. Dishcloth Diva! Check out her website to see my interview. 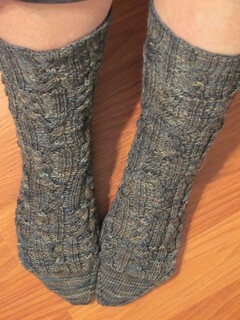 She knitted my Beginner’s Socks recently and liked the pattern – so she approached me to do an interview. 🙂 I was so flattered to be asked! I did the called for 14 repeats of the budding lace chart, but wanted more of the lily of the valley than just two repeats, so I did 4 total repeats of that. I worked the first and second chart, and then repeated the first and second chart (starting the first chart at row 3). 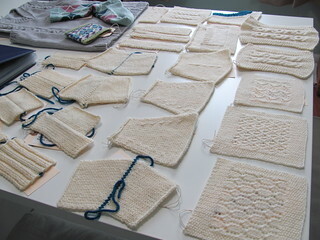 It meant that I had the wrong number of stitches for starting the edging chart – I was off by 4 too many stitches on each side. I added a decrease on each side of the triangles on the first row of the edging, and in between the paired yarnovers on row 3 at the edges of the triangles- this made my stitch counts work for the edging. I ended up running out of yarn with just 2 rows and the bind off left (oops! 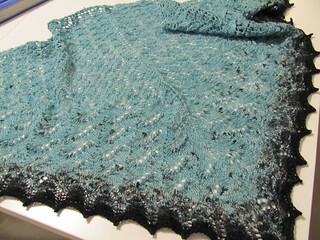 ), so I doubled up some black cobweb lace yarn I had for those few rows. They are now almost done. 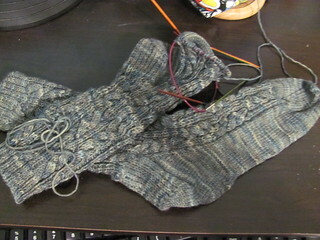 I think I might pull out my Nightingale socks to finish next. Sorry for being MIA for so long! I’ve been busy, busy with house remodeling (it’s done now!) and holiday goings on, and getting back into the homeschool swing. I actually have a couple of things to show you today! It still needs to be blocked. I evidently casted on much more tightly than I bound off, because the starting edge is much smaller than the finished end! Oh well. 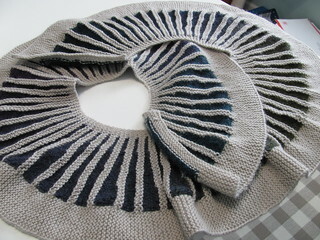 A good blocking will add to the drape anyway. 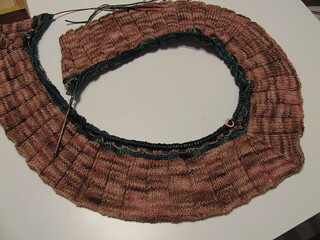 Once I frogged it back (since I was forgetting to do the short rows in between the blocks) it went much better! I’m very happy with it. 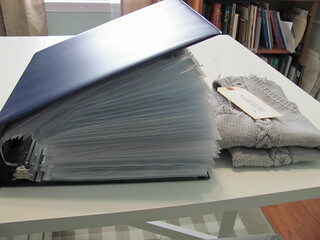 That’s right, I’m ready to mail in my Master Knitter Level 2 binder!!!!!!! 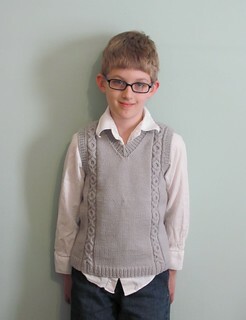 My oldest son modeling the level 2 vest I designed. I just have to finish up the history report (it’s almost done as I type this!) and get it proof-read, and then I’ll mail it off tomorrow morning! It feel so very, very good to be at the finish line of this level!! I’m beside myself!! This really should be a Masters Monday post, but I finished this yesterday, so why not post it today! 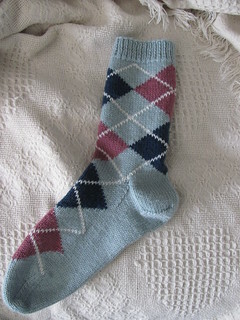 I finally finished my argyle sock for Master Knitter Level 2! This was my second attempt, and it looks much better than my first! Side seam on leg has to be left unsewn, so the committee members can see inside the sock to see my work. I made no modifications to the pattern whatsoever. It fits my foot, but I’m unsure as to whether it will fit my ankle – but that doesn’t matter because this sock will never be worn anyhow – it’s going to stay in my Master Knitter notebook. 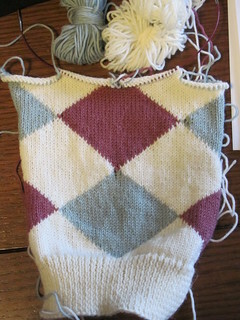 And I did not enjoy knitting it – intarsia is not my thing! – so I highly doubt it will ever get a partner, anyhow. Besides, I ran out of yarn (since this was my second attempt) so I’d need to buy more of this not-inexpensive-yarn to knit a matching mate. 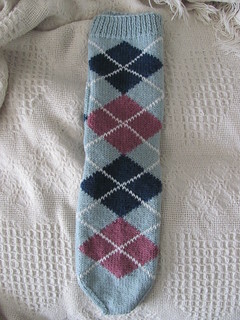 I may tackle another pair of argyle socks sometime in the future – but not anytime in the near future! 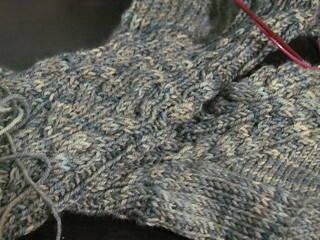 Side seam on foot – my seaming technique will be reviewed as well as my ability to work intarsia correctly, and construct a sock correctly. Diamonds over top of foot. 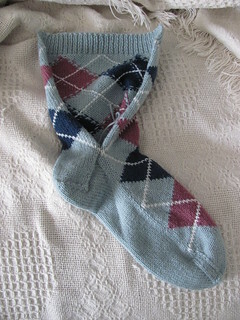 I had gotten even father than this with it – I had finished the instep intarsia as well – and while in the process of weaving in my ends at the color changes I noticed that I didn’t twist at a color change towards the end of the sock! Ugh! 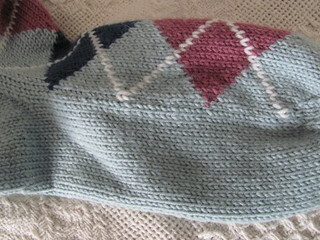 But it all worked out well, anyhow, because I like the newer pattern much better (a side seam makes so much more sense!) and I prefer my second color combination as well. This one was going to have navy lines. Hopefully I’ll be ready to mail my portfolio in soon! !